Congratulations! Engagement is one of the most exciting times in life. But, unfortunately, that excitement can be accompanied by a lot of stress. The average millennial carries a student loan debt of $29,400, according to the Institute for College Access and Success, meaning the average couple may carry almost $60,000 in debt between them. Figuring out how to manage this while paying for your wedding and other bills may be one of your early challenges, and the stress can spill over into your relationship. Here are some strategies to keep both your finances and your relationship strong as you begin your wedding planning. Lack of communication is one of the biggest causes of divorce. Failing to communicate causes problems to pile up until they grow out of control. This especially applies to money issues. To prevent this and keep communication channels open, set aside at least five minutes each day for meaningful dialogue with your partner. Spend this time discussing your feelings about each other, your life together and your relationship. Apply this principle to establish good financial communication by setting aside regular time each week to discuss money matters. 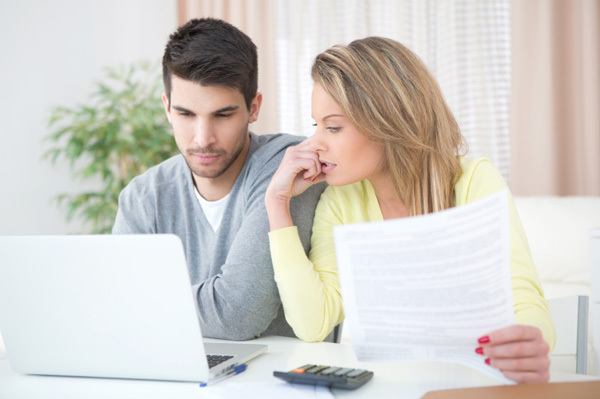 It's important for you to discuss some fundamental financial topics before getting married. The first item on the agenda is adding up how much you have and how much you owe. Knowing this puts you in a position to do financial planning and discuss your financial goals. Some of these should include paying off student loans and credit card debt, building an emergency fund, buying a house, saving for retirement and starting a family. One financial item you need to address is whether to put your money in separate or joint bank accounts. According to SmartMoney research, 64 percent of couples put all their money in joint accounts, 14 percent keep their money in separate accounts and 18 percent use both. Ruth Hayden, author of "For Richer, Not Poorer," suggests that couples start with a combination of separate and joint accounts to get used to cooperating on money management while still preserving some spending autonomy. Another pressing financial issue you need to address is paying for wedding planning. Between the venue rental, engagement rings, wedding dress and vendors, wedding expenses add up quickly. Cutting costs on these high-ticket items is the key to saving on wedding planning. For instance, event planner Katherine Kennedy, author of "Priceless Weddings for under $5,000," suggests reducing venue costs by using free or low-cost locations such as backyards and national parks. Travel on all-inclusive package deals or during the off-season to save money. DIY projects and tips also help cut costs. For example, look for high-quality makeup and beauty products and do your makeup yourself with some help from beauty blogs. Dealing with financial stress can distract you from the romantic side of your relationship. One way to renew your romance is having a regular date night. Life coach Samantha Sutton says many couples are so busy with handling dating details, such as arranging babysitters, that they've forgotten how to have fun on dates. She recommends that couples should take steps to make date nights special, such as reminding themselves why they love the other person, dressing up for the occasion and focusing on having fun instead of allowing stressful topics to intrude on the evening. She advises agreeing ahead of time on topics that will not be discussed during the date, so you can focus your attention on making the evening memorable.